Among the upcoming legislative primary elections, two Brooklyn State Assembly races with very different storylines are intensifying. Unusual electoral circumstances in the 44th and 46th Assembly Districts make the contests races to watch. Located in Downtown Brooklyn, the 44th seat, which is opening up due to the retirement of the longtime incumbent, is home to a short, frenzied primary race among three Democrats. In the 46th, an embattled short-term incumbent and an experienced Democratic challenger battle for the Southern Brooklyn seat. In the 46th, former Assemblymember Alec Brook-Krasny resigned in July 2015 to take a private sector job and Pamela Harris won the seat in a November special election. Now, with less than a year of experience in the Assembly, Harris faces Kate Cucco, who served as chief of staff for Brook-Krasny from 2008 to 2015. In the 44th, Assemblymember James Brennan announced his sudden retirement from public office this past May, just eights days before the candidate filing deadline. He simultaneously backed the race’s apparent frontrunner, Robert Carroll, who had been running for District Leader and eyeing an Assembly bid down the road. Two other Democrats, Troy Odendhal and Rob Curry-Smithson, announced their candidacy soon after. One primary features two women, the other three men. In one, the 46th, establishment Democrats are divided between the two candidates, while in the other, the 44th, most Democratic elected officials and clubs are coalescing behind one candidate. While these races show interesting decisions within the city’s Democratic machinery, the two districts reflect the common socioeconomic contrasts of neighboring communities in New York City. District 44 includes both Park Slope, a neighborhood that, according to a 2010-2012 Census report, had a median household income of $87,896, and Flatbush, at $42,144 per household. District 46 includes similar economic disparities, with communities like Bay Ridge, home to a median household income of $53,500, and Coney Island, at $29, 712. Cucco, who is from Ohio but has called Bay Ridge home for a number of years, says that all residents of the district raise similar concerns no matter their income. Cucco says her experience working for the residents of the district as Brook-Krasny’s chief of staff makes her a stronger candidate than the incumbent, Harris, the first black Assembly candidate to win a majority white district in New York City’s history. If elected, Cucco says election reform remains at the top of her legislative to-do list. “For such a progressive state, we’re so behind the curve on where we stand with elections,” she said. 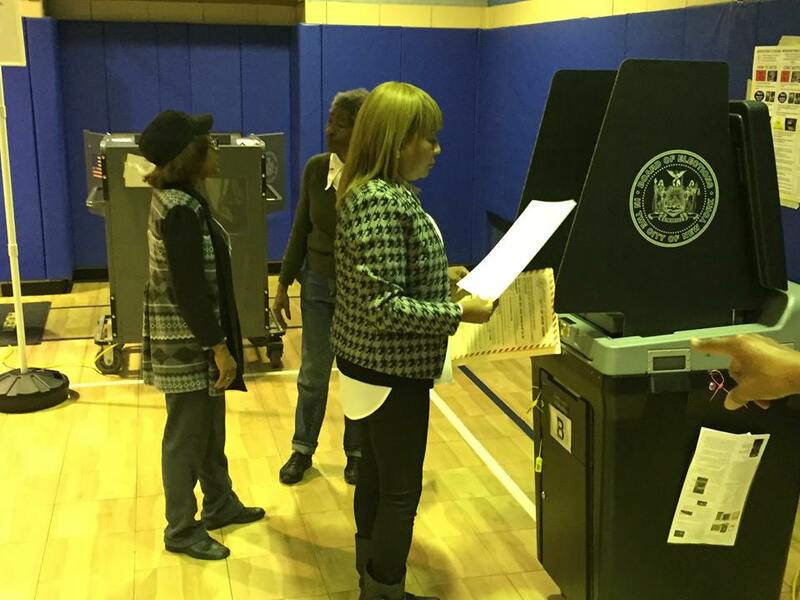 “I think we should make it easier for all constituents, members of the state, to vote.” Despite New York’s notoriously antiquated election and voting laws, little movement has been made on reform. Like Cucco, Assemblymember Harris, who grew up in the district, says she finds the interests of residents to be similar in most neighborhoods. Harris, a former corrections officer at Rikers and native of Coney Island, said she represents all of her constituents and does not see the division between police and communities of color that has been the focus of much discussion. Harris said addressing personal issues about her family continues to be the most challenging part of the campaign. The Daily News reported that Harris and her husband filed for bankruptcy in 2013 and there have been multiple reports detailing questions about the nonprofit she founded, the Coney Island Generation Gap, and its tax filings. Harris publicly responded to the Daily News report and addressed the reasons behind her bankruptcy, including health issues for her and other family members. “But you know, wait, don’t worry about me,” she continued, and asked rhetorically, “What is it you need? What is it that you would like me to do?” Harris said that she wants the focus of the campaign to be constituents’ needs, not her personal issues. Cucco recently released a 70-Point Policy plan which focuses on election reform, in addition to free SUNY and CUNY tuition for students with at least a B average and improving access to affordable housing. If re-elected, Harris said she hopes to continue to fight for the large senior population in District 46 through affordable housing and social engagement programs. A bill authored by Harris aimed at helping residents in naturally occurring retirement homes qualify for state funding was signed into law by Gov. Andrew Cuomo last month. A flashpoint in the race is the involvement of outside Super PACs, which have been spending on behalf of both Cucco and Harris. The issue was at the center of contentious exchanges during a Thursday evening debate on NY1's Inside City Hall, with the main issue at hand a state bill for an education tax credit that would mainly benefit donors to private schools. Harris' nonprofit also came up during the NY1 debate. The winner of the 46th District Democratic primary will face Lucretia Regina-Potter, of the Republican Party, Mikhail Usher, of the Conservative Party, and Patrick Dwyer, of the Green Party, in the general election. In an overwhelmingly Democratic district, that candidate’s party will be favored to win. In State Assembly District 44, three Democrats fight for the seat being left vacant by Assemblymember James Brennan, who announced in May that after 32 years in office he will not seek re-election. Brennan announced his retirement and endorsed attorney Robert Carroll. Carroll, who identifies as a progressive and actively supported Bernie Sanders in the presidential primary, dropped out of the District Leader race to pursue the open seat. The somewhat surprising vacancy and endorsement brought criticism from Troy Odendhal, a community developer and freelance journalist who is running for the seat in the Democratic primary. “With such short notice on the vacancy of the seat, this was used as tactic by the democratic machine to overtly exclude potential candidates in the 44th Assembly District,” reads a statement on Odendhal’s website. Odendhal filed an objection with the Board of Elections against his challenger regarding the signatures Carroll collected to get on the ballot. According to Kings County Politics, Odendhal’s campaign found errors with the petitions, including signatures of individuals who live out of the district, without addresses listed or names written in illegible handwriting. Carroll filed more than 7,300 signatures; Odendhal 870 (the required number to get on the ballot is 500). A third candidate, Rob Curry-Smithson, a history teacher who, like Carroll, campaigned for Bernie Sanders, describes himself not only as a “Berniecrat” but as “an educator, not the establishment,” on his campaign’s website. Curry-Smithson channels Sanders’ rhetoric when talking about public education and healthcare. In an interview with the Brooklyn Eagle, he explained the reason behind his reform campaign, and referred to the process by which Brennan was attempting to choose replacement. “I also was concerned that there seemed to be no competition, but a passing of the torch from someone who has been in office since I was two years old to a successor chosen by the party establishment,” he wrote in an email to the Eagle. Carroll not only has the backing of Brennan, but a long list of Democratic officials and organizations, including New York City Comptroller Scott Stringer, New York City Public Advocate Letitia James, the Working Families Party, and the New York State United Teachers labor union. According to his campaign website, if elected to office, Carroll hopes to improve ethics in Albany, institute paid sick leave as well as strengthen gun control laws. As expected, he leads in fundraising. Carroll has received $98,217 for his Assembly run as of July, according to his State Board of Elections filings. Odendhal, who is self-funding his campaign, has spent about $5446.00 on his campaign, as of late July filings, and Curry-Smithson has no fundraising recorded to date. The winner of the District 44 Democratic primary will face Republican candidate Glenn Nocera, president of the Brooklyn Tea Party, who has also the Conservative Party line on the ballot, in the November general election. If successful in the Democratic primary, Carroll is set to have the Working Families Party ballot line in November. Democrats have a large majority in the state Assembly and winners of the 44th and 46th District Democratic primaries are likely to be part of that majority in Albany when the State Legislature reconvenes in January. The results of November’s general elections will determine control of the state Senate, which has been led by Republicans over most of the past several decades, but where the balance of power is almost evenly split. Turnout for the September 13 primaries is not expected to be high, especially given that it is the third primary date of this election year in New York, after the April presidential primary and June congressional primary. November is likely to be a different story, though, with the presidential race drawing more voters to the ballot box. Cucco, running in the 46th AD, said the over-saturation of the presidential campaign may inspire residents to get more involved this election cycle. “I think that everything that’s happening on the national level this year, you know with both parties, people, whether they like or don’t like the national candidates running for president, they’re hyper aware of the sense of local government and its importance,” she said. Note: this article has been corrected regarding the timing of Brennan's retirement announcement and how much time there was for candidates to get on the ballot.